The title of each option is listed here. The value of each option is listed here. Here, you can select the entry that should be preselected when the page is loaded in the browser. All options that have the same value as the default option will initially be displayed in the browser as selected. Please ensure that you use unique values for individual options. A new option entry will be created. The currently selected option entry is deleted. Opens a dialog where the option's title and value can be modified. 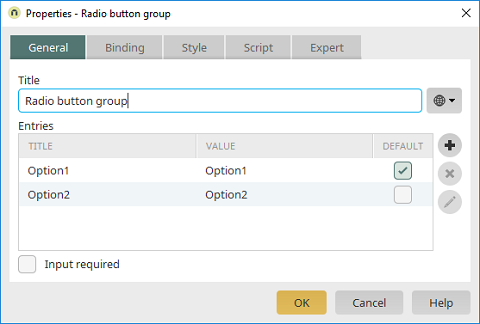 The radio button group will be made into a mandatory field.